Siam Natural Makrut (kaffir leaf powder) - herbal spa massage health treatments from Thailand . . . 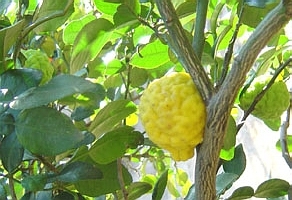 Native to Indonesia, the Makrut (kaffir lime) Citrus hystrix is a green maturing to yellow skinned citrus fruit with a high acidic content. The powdered Makrut (kaffir) leaf is used as a healing massage compound as a fragrant, centering treatment that stimulates many senses. The Makrut lime leaf (& peel) powder is used in massage as a natural scrub - and a much sought after treatment in Thai herbal poultices and compresses. Makrut helps clarify and provide skin conditioning with it's mild astringent attributes. The leaves have a strong aromatic fragrance and a floral essential oil is extracted from the fruit and rind for use in aromatherapy and various cosmetic & beauty products (i.e Ralph Lauren) including hair products promoting soft and silky textures.